Outline proposals for residential development are starting to be prepared for the land between 107 & 127 Capel Street, an area identified for residential development within the Dover Land Allocations Local Plan, adopted January 2015. Following an earlier appeal decision, Hume Planning Consultancy has been instructed by the landowners to prepare a fresh housing scheme to address the specific design concerns raised by the appeal Inspector. To inform the design process, interested parties from the village were invited to review and discuss the baseline work and suggested design choices, which were shown on a series of exhibition boards at the Capel-le-Ferne Village Hall between 10:00am – 14:00pm on the 26th January 2019. Members of the public were also able to raise any questions with the consultancy team at the public exhibition, and a questionnaire was provided for residents to fill out and record their feedback, which will help influence the new proposals. The material shown at the public exhibition, as well as digitised version of the questionnaire, can be found below for those unable to attend the exhibition or who wish to review the material again. Last comments on the emerging proposals should be made by noon on Monday 4th February 2019. 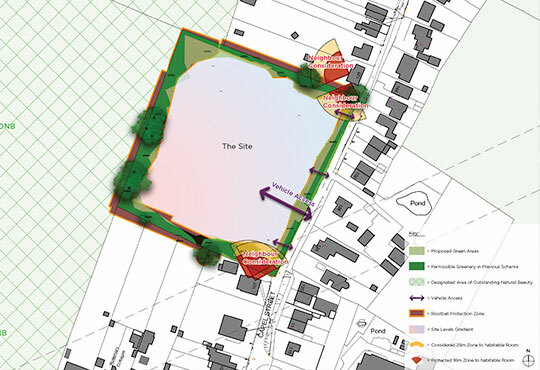 Do you accept that the site is suitable for housing development, and that the design must be guided by the local plan policy criteria as well as the previous Inspectors’ findings? Would you prefer the design of the housing to be contemporary or traditional? Do you agree with the broad guideline of this mix? Would you prefer to see courtyard style communal parking or parking provided on the driveways or carports to each individual plot? Do you have any other design related comments?